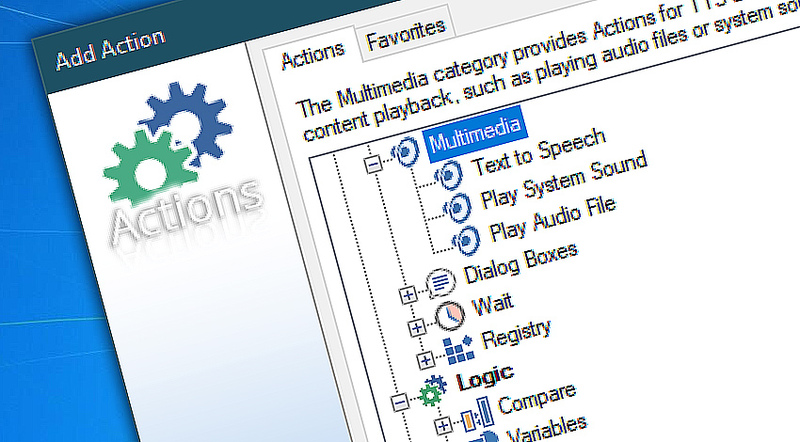 Multimedia category contains Actions that can play audible system alerts or audio files. Audible alerts are good means to attract user attention. However, they depend on configuration of sound settings and rely on the presence of user. For important notifications it is best to complement audible alerts with other types of notifications, such as email. Automated IT processes rarely require human presence, but, when they do, it might be important enough to use immediate means for attracting user attention including audible alerts and prerecorded messages. Play System Sound plays the selected notification from the Windows sound scheme. If the system sound scheme is changed by user, the notification sound changes as well. Play Audio File plays the specified audio file in WAV format. The audio file can be played in background (while the Task continues with following actions) or the Task can wait for the end of playback to continue. Play System Sound · plays a sound from Windows sound scheme. Play Audio File · plays a specified audio file. Automation Workshop is an awesine product — light-weight, easy to use and gives me the control I need. —Christopher I.